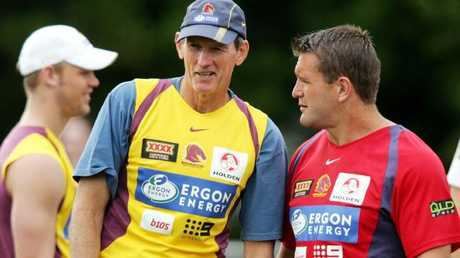 BRONCOS legend Shane Webcke has called for Brisbane bosses to smoke the peace-pipe with Wayne Bennett and honour his legacy by handing the super coach one final contract for 2020. 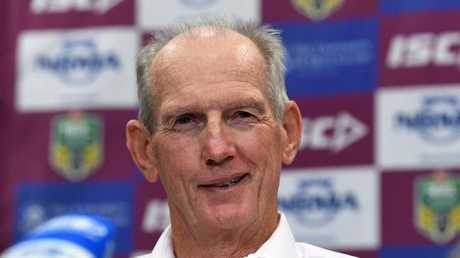 As Brisbane prepare for this Saturday's night blockbuster against the Roosters in Sydney, Webcke believes Bennett - the club's only premiership coach - has earnt the right to exit on his terms. Bennett is at loggerheads with Brisbane CEO Paul White and chairman Karl Morris over his blueprint to coach a 27th and final season in 2020. With the Broncos ready to mount a finals charge, Webcke expressed his disappointment at Brisbane's infighting and says the saga can be resolved swiftly by rubberstamping a new deal for Bennett. "After everything Wayne has done for the Broncos, the powers-that-be should just give him a 12-month extension and get on with it," Webcke said. "I don't think I've ever seen anything like this in our history. "To be honest, it concerns me - it's embarrassing for the club. "If that's all Wayne is seeking - one more year of coaching (in 2020) - well he's earnt that right given all the premierships and success he has brought to this club. Webcke was one of Bennett’s all time favourite players. "If Wayne was to get that extension and the Broncos didn't go well in 2020 … no-one would criticise the club for being loyal, but what's happening at the moment concerns me." 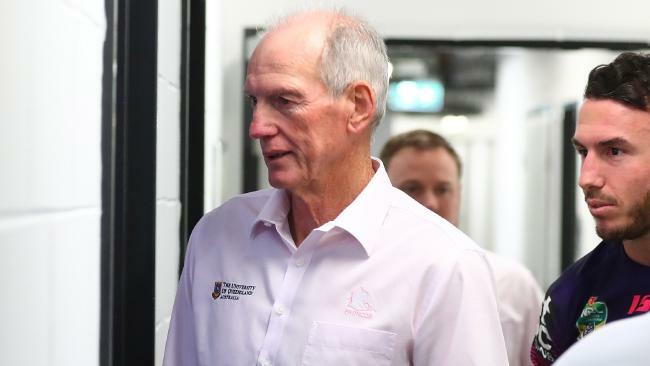 Broncos hierarchy have rejected Bennett's request for a 12-month extension, instead offering the 68-year-old another senior administrative job at Red Hill in 2020. Bennett has no interest in accepting a front-office position and is prepared to leave the Broncos if he can secure another NRL coaching gig. Statistically, Bennett's record warrants an extension. Since his return to the Broncos in 2015, Bennett has won 65 of 102 games for a success rate of 63.7 per cent, ranking him second, behind Melbourne's Craig Bellamy, among all NRL coaches during that time. Brisbane are on the verge of a fourth straight finals campaign under Bennett, whose proposal entails him coaching the Broncos in 2020 before stepping aside for assistant Jason Demetriou. Webcke, who featured in four of Brisbane's six premiership wins during their golden age between 1992-2006, urged the warring factions to consider the Broncos brand. Bennett’s time at Brisbane could be running out. AAP Image/Dave Hunt. "What everyone involved has to remember is what that club stands for," he said. "Things would be different if Wayne was coaching horribly, but he's not. "There is some uncharted ground we're entering because we had such stability at the Broncos. "I remember in the early years, Wayne was called into question and the club responded by signing him for five years. "Wayne hasn't lost the playing group, so in my mind he rightly deserves one more year. This can be done tidily." White conceded last Friday that Bennett may not get his "perfect-world" wish for a farewell in 2020, but still hopes the super coach can deliver a seventh premiership this season. "I want Wayne to know he has the full support to take us as far as he can," White said. "Hopefully that's winning a grand final and that's his job."